Over the past several months, I have had a number of friends and colleagues lose their jobs. The stress that comes from losing a job is often beyond imagining. It is a mixture of emotional, physical and relational stress. If you have lost your job or feel that your employment is in jeopardy, then you are facing a very difficult challenge. The key to managing this crisis is to learn where genuine, sustainable strength comes from. Many people depend upon their external circumstances to give them comfort and security. When those situations are disrupted by the loss of a job, the failure of a marriage or a natural disaster, they discover that they are more emotionally fragile than they may have thought. Their comfortable life proved to be an unsecure one as a result. They may have thought of themselves as a happy, carefree person, until one of those situations that they depend upon for their happiness collapses and they find themselves at wits end. Stress is a product of our perception of the situations we are in. When we feel out of control, under threat and unable to see beyond the pain of the moment, we experience stress. It is analogous to the issue of morale that I wrote about a few weeks ago and was the subject of an extensive discussion that has been reproduced as a free e-book entitled Managing Morale in a time of change – a Triiibes discussion e-book. There is possibly no greater stress than to be a prisoner of war. 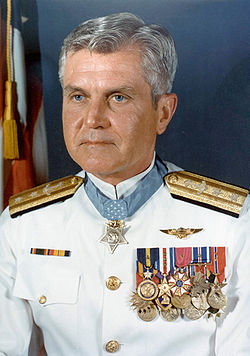 It is what Admiral James Stockdale felt intensely as the highest ranking US military officer in the Hanoi Hilton during the Vietnam War. Business writer Jim Collins had the opportunity to interview Admiral Stockdale. He was surprised by what he learned from the man. Listen to Collins share briefly this story and the lessons he learned. Remember what Stockdale told him? How did he and his fellow prisoners do this? Where did they find the inner resiliency and fortitude to hold together under such stress. Stockdale and his men understood that ultimately they are responsible for how they managed stress and conflict.They could not pass it off to any one. Not the North Vietnamese; not the US government; not, even, their families. It was all on their shoulders. From a speech entitled, Courage Under Fire, Stockdale describes his experience in reflecting upon the writings of Epictetus, a Greek Stoic writer. I’m not talking about brainwashing; there is not such thing. I’m talking about having looked over the brink of the pit and realized the truth of that linchpin of Stoic thought: that the thing that brings down a man is not pain, but shame! Why did those men in “cold soak” after their first rope trip eat their hearts out and feel so unworthy when the first American contacted them? Epictetus knows human nature well. In that prison laboratory, I do not know of a single case where a man was able to erase his conscience pangs with some laid-back pop psychology theory of cause and effect. Epictetus emphasizes time and again that a man who lays off the causes of his actions to third parties or forces is not leveling with himself. He must live with his own judgments if he is to be honest with himself. (And the “cold soak” tends to make you honest.) “But if a person subjects me to fear of death, he compels me,” says a student. “No,” says Epictetus, “It is neither death, nor exile, nor toil, nor any such things that is the cause of your doing, or not doing, anything, but only your opinions and the decisions of your Will.” “What is the fruit of your doctrines, “ he answered. You can have these only if you are honest and take responsibility for your own actions. You’ve got to get it straight! You are in charge of you. Stockdale was a prisoner of war and Epictetus’ a slave who gained his freedom and became a teacher. What they both learned is that peace and security come from within, not from our external circumstances. With this mindset, change becomes less a disruptive, disorienting experience, and more the context that tests our inner resolve and resilience to triumph over hard times. 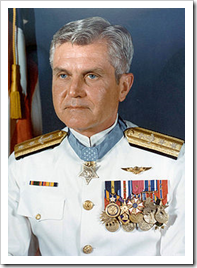 That conversation with Admiral Stockdale stayed with me, and in fact had a profound influence on my own development. Life is unfair – sometimes to our advantage, sometimes to our disadvantage. We will all experience disappointments and crushing events somewhere along the way, setbacks for which there is no “reason,” no one to blame. It might be disease; it might be injury; it might be an accident; it might be losing a loved one; it might be getting swept away in a political shake-up’; it might be getting shot down over Vietnam and thrown into a POW camp for eight years. What separates people, Stockdale taught me, is not the presence or absence of difficulty, but how they deal with the inevitable difficulties of life. Stress is not relieved by escaping. It only pushes the emotions and the pain deeper into our being. It is not relieved by pure optimism, hoping against hope that things will get better. Stress is only dealt with by honesty and determination in reflection on the way circumstances actually are. If you can develop this attitude, then you will find that your peace and security are not determined by external circumstances, whether you have this job or that one. With this mindset, new opportunities can be seen for what they are, rather than as impossible dreams that are not worth pursuing. I encourage you to read In Love and War by Admiral Stockdale and his wife Sybil, Good To Great, by Jim Collins and The Enchiridion by Epictetus. You will find your own inner strength and confidence growing. Tagged with admiral, Epictetus, Good to Great, Hanoi Hilton, Jim Collins, stockdale, Stoic, stress, Vietname.